Gout patients with established cardiovascular (CV) disease treated with ULORIC had a higher rate of CV death compared to those treated with allopurinol in a CV outcomes study [see Warnings and Precautions (5.1)]. Consider the risks and benefits of ULORIC when deciding to prescribe or continue patients on ULORIC. ULORIC should only be used in patients who have an inadequate response to a maximally titrated dose of allopurinol, who are intolerant to allopurinol, or for whom treatment with allopurinol is not advisable [see Indications and Usage (1)]. These highlights do not include all the information needed to use ULORIC safely and effectively. See full prescribing information for ULORIC. For the safe and effective use of allopurinol, see allopurinol prescribing information. 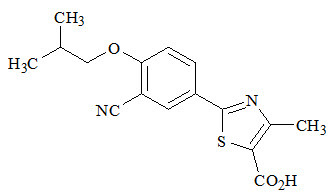 ULORIC is a xanthine oxidase (XO) inhibitor indicated for the chronic management of hyperuricemia in adult patients with gout who have an inadequate response to a maximally titrated dose of allopurinol, who are intolerant to allopurinol, or for whom treatment with allopurinol is not advisable. The recommended ULORIC dosage is 40 mg or 80 mg once daily. The recommended starting dosage of ULORIC is 40 mg once daily. For patients who do not achieve a serum uric acid (sUA) less than 6 mg/dL after two weeks, the recommended ULORIC dosage is 80 mg once daily. ULORIC can be taken without regard to food or antacid use [see Clinical Pharmacology (12.3)]. No dose adjustment is necessary when administering ULORIC in patients with mild or moderate renal impairment. The recommended dosage of ULORIC is limited to 40 mg once daily in patients with severe renal impairment [see Use in Specific Populations (8.6) and Clinical Pharmacology (12.3)]. No dose adjustment is necessary in patients with mild to moderate hepatic impairment [see Use in Specific Populations (8.7) and Clinical Pharmacology (12.3)]. Gout flares may occur after initiation of ULORIC due to changing serum uric acid levels resulting in mobilization of urate from tissue deposits. Flare prophylaxis with a non-steroidal anti-inflammatory drug (NSAID) or colchicine is recommended upon initiation of ULORIC. Prophylactic therapy may be beneficial for up to six months [see Clinical Studies (14.1)]. If a gout flare occurs during ULORIC treatment, ULORIC need not be discontinued. The gout flare should be managed concurrently, as appropriate for the individual patient [see Warnings and Precautions (5.2)]. 40 mg tablets, light green to green, round, debossed with "TAP" and "40"
80 mg tablets, light green to green, teardrop shaped, debossed with "TAP" and "80"
ULORIC is contraindicated in patients being treated with azathioprine or mercaptopurine [see Drug Interactions (7)]. In a cardiovascular (CV) outcome study (ClinicalTrials.gov identifier NCT01101035), gout patients with established CV disease treated with ULORIC had a higher rate of CV death compared to those treated with allopurinol. The CV outcomes study in patients with gout (CARES) was a randomized, double-blinded, allopurinol-controlled, non-inferiority study conducted to evaluate the risk of major adverse cardiovascular events (MACE) in patients with gout who were treated with ULORIC. The study enrolled patients who had a history of major CV disease, cerebrovascular disease or diabetes mellitus with micro- and/or macrovascular disease. The primary endpoint was the time to first occurrence of MACE defined as the composite of CV death, nonfatal MI, nonfatal stroke, or unstable angina with urgent coronary revascularization. The study was designed to exclude a prespecified risk margin of 1.3 for the hazard ratio of MACE. Results showed that ULORIC was non-inferior to allopurinol for the primary endpoint of MACE [Hazard Ratio: 1.03, 95% Confidence Interval (CI): 0.89, 1.21]. However, there was a significant increase in CV deaths in patients treated with ULORIC (134 [1.5 per 100 patient-years]) compared to patients treated with allopurinol (100 [1.1 per 100 patient-years]) [Hazard Ratio: 1.34, 95% CI: 1.03, 1.73]. Sudden cardiac death was the most common cause of adjudicated CV deaths in the ULORIC group (83 of 3,098; 2.7%) as compared to the allopurinol group (56 of 3,092; 1.8%). ULORIC was similar to allopurinol for nonfatal MI, nonfatal stroke and unstable angina with urgent coronary revascularization [see Clinical Studies (14.2)]. Because of the increased risk of CV death, ULORIC should only be used in patients who have an inadequate response to a maximally titrated dose of allopurinol, who are intolerant to allopurinol, or for whom treatment with allopurinol is not advisable [see Indications and Usage(1)]. Consider the risks and benefits of ULORIC when deciding to prescribe or continue patients on ULORIC [see Indications and Usage (1)]. Consider use of prophylactic low-dose aspirin therapy in patients with a history of CV disease. Physicians and patients should remain alert for the development of adverse CV event signs and symptoms. Patients should be informed about the symptoms of serious CV events and the steps to take if they occur. In order to prevent gout flares when ULORIC is initiated, concurrent prophylactic treatment with an NSAID or colchicine is recommended [see Dosage and Administration (2.4)]. There have been postmarketing reports of fatal and nonfatal hepatic failure in patients taking ULORIC, although the reports contain insufficient information necessary to establish the probable cause. During randomized controlled studies, transaminase elevations greater than three times the upper limit of normal (ULN) were observed (AST: 2%, 2%, and ALT: 3%, 2% in ULORIC and allopurinol-treated patients, respectively). No dose-effect relationship for these transaminase elevations was noted [see Clinical Pharmacology (12.3)]. Postmarketing reports of serious skin and hypersensitivity reactions, including Stevens-Johnson Syndrome, drug reaction with eosinophilia and systemic symptoms (DRESS) and toxic epidermal necrolysis (TEN) have been reported in patients taking ULORIC. Discontinue ULORIC if serious skin reactions are suspected [see Patient Counseling Information (17)]. Many of these patients had reported previous similar skin reactions to allopurinol. ULORIC should be used with caution in these patients. In Phase 2 and 3 clinical studies, a total of 2757 patients with hyperuricemia and gout were treated with ULORIC 40 mg or 80 mg daily. For ULORIC 40 mg, 559 patients were treated for ≥6 months. For ULORIC 80 mg, 1377 patients were treated for ≥6 months, 674 patients were treated for ≥1 year and 515 patients were treated for ≥2 years. In the CARES study, a total of 3098 patients were treated with ULORIC 40 mg or 80 mg daily; of these, 2155 patients were treated for ≥1 year and 1539 were treated for ≥2 years [see Clinical Studies (14.2)]. Of the patients who received allopurinol, 10 received 100 mg, 145 received 200 mg, and 1122 received 300 mg, based on level of renal impairment. In the CARES study, liver function abnormalities and diarrhea were reported in more than 1% of patients treated with ULORIC, although not at a rate more than 0.5% greater than allopurinol. In clinical studies the following adverse reactions occurred in less than 1% of patients and in more than one subject treated with doses ranging from 40 mg to 240 mg of ULORIC. This list also includes adverse reactions (less than 1% of patients) associated with organ systems from Warnings and Precautions. The following adverse reactions have been identified during postapproval use of ULORIC. Because these reactions are reported voluntarily from a population of uncertain size, it is not always possible to reliably estimate their frequency or establish a causal relationship to drug exposure. Blood and Lymphatic System Disorders: agranulocytosis, eosinophilia. Skin and Subcutaneous Tissue Disorders: generalized rash, Stevens-Johnson Syndrome, hypersensitivity skin reactions, erythema multiforme, drug reaction with eosinophilia and systemic symptoms, toxic epidermal necrolysis. ULORIC is an XO inhibitor. Based on a drug interaction study in healthy patients, febuxostat altered the metabolism of theophylline (a substrate of XO) in humans [see Clinical Pharmacology (12.3)]. Therefore, use with caution when coadministering ULORIC with theophylline. Drug interaction studies of ULORIC with other drugs that are metabolized by XO (e.g., mercaptopurine and azathioprine) have not been conducted. Inhibition of XO by ULORIC may cause increased plasma concentrations of these drugs leading to toxicity [see Clinical Pharmacology (12.3)]. ULORIC is contraindicated in patients being treated with azathioprine or mercaptopurine [see Contraindications (4)]. Based on drug interaction studies in healthy patients, ULORIC does not have clinically significant interactions with colchicine, naproxen, indomethacin, hydrochlorothiazide, warfarin or desipramine [see Clinical Pharmacology (12.3)]. Therefore, ULORIC may be used concomitantly with these medications. Limited available data with ULORIC use in pregnant women are insufficient to inform a drug associated risk of adverse developmental outcomes. No adverse developmental effects were observed in embryo-fetal development studies with oral administration of febuxostat to pregnant rats and rabbits during organogenesis at doses that produced maternal exposures up to 40 and 51 times, respectively, the exposure at the maximum recommended human dose (MRHD). No adverse developmental effects were observed in a pre- and postnatal development study with administration of febuxostat to pregnant rats from organogenesis through lactation at an exposure approximately 11 times the MRHD (see Data). In a pre- and postnatal development study in pregnant female rats dosed orally from gestation Day 7 through lactation Day 20, febuxostat had no effects on delivery or growth and development of offspring at a dose approximately 11 times the MRHD (on an AUC basis at a maternal oral dose of 12 mg/kg/day). However, increased neonatal mortality and a reduction in neonatal body weight gain were observed in the presence of maternal toxicity at a dose approximately 40 times the MRHD (on an AUC basis at a maternal oral dose of 48 mg/kg/day). There are no data on the presence of febuxostat in human milk, the effects on the breastfed infant, or the effects on milk production. Febuxostat is present in rat milk. The developmental and health benefits of breastfeeding should be considered along with the mother's clinical need for ULORIC and any potential adverse effects on the breastfed child from ULORIC or from the underlying maternal condition. Safety and effectiveness of ULORIC in pediatric patients have not been established. No dose adjustment is necessary in elderly patients. Of the total number of patients in Studies 1, 2, and 3 (clinical studies of ULORIC in the treatment of gout) [see Clinical Studies (14.1)], 16% were 65 and over, while 4% were 75 and over. Comparing patients in different age groups, no clinically significant differences in safety or effectiveness were observed but greater sensitivity of some older individuals cannot be ruled out. The Cmax and AUC24 of febuxostat following multiple oral doses of ULORIC in geriatric patients (≥65 years) were similar to those in younger patients (18 to 40 years) [see Clinical Pharmacology (12.3)]. No dose adjustment is necessary in patients with mild to moderate renal impairment (Clcr 30 to 89 mL/min). For patients with severe renal impairment (Clcr 15 to 29 mL/min), the recommended dosage of ULORIC is limited to 40 mg once daily [see Dosage and Administration (2.2) and Clinical Pharmacology (12.3)]. No dose adjustment is necessary in patients with mild or moderate hepatic impairment (Child-Pugh Class A or B). No studies have been conducted in patients with severe hepatic impairment (Child-Pugh Class C); therefore, caution should be exercised in these patients [see Clinical Pharmacology (12.3)]. The effect of ULORIC on cardiac repolarization as assessed by the QTc interval was evaluated in normal healthy patients and in patients with gout. ULORIC in doses up to 300 mg daily (3.75 times the maximum recommended daily dosage), at steady-state, did not demonstrate an effect on the QTc interval. In healthy patients, maximum plasma concentrations (Cmax) and AUC of febuxostat increased in a dose proportional manner following single and multiple doses of 10 mg (0.25 times the lowest recommended dosage) to 120 mg (1.5 times the maximum recommended dosage). There is no accumulation when therapeutic doses are administered every 24 hours. Febuxostat has an apparent mean terminal elimination half-life (t1/2) of approximately 5 to 8 hours. Febuxostat pharmacokinetic parameters for patients with hyperuricemia and gout estimated by population pharmacokinetic analyses were similar to those estimated in healthy patients. The absorption of radiolabeled febuxostat following oral dose administration was estimated to be at least 49% (based on total radioactivity recovered in urine). Maximum plasma concentrations of febuxostat occurred between 1 and 1.5 hours postdose. After multiple oral 40 mg and 80 mg once daily doses, Cmax is approximately 1.6 ± 0.6 mcg/mL (N=30), and 2.6 ± 1.7 mcg/mL (N=227), respectively. Absolute bioavailability of the febuxostat tablet has not been studied. Following multiple 80 mg once daily doses with a high fat meal, there was a 49% decrease in Cmax and an 18% decrease in AUC, respectively. However, no clinically significant change in the percent decrease in serum uric acid concentration was observed (58% fed vs 51% fasting). Thus, ULORIC may be taken without regard to food. The Cmax and AUC of febuxostat and its metabolites following multiple oral doses of ULORIC in geriatric patients (≥65 years) were similar to those in younger patients (18 to 40 years). In addition, the percent decrease in serum uric acid concentration was similar between elderly and younger patients. No dose adjustment is necessary in geriatric patients [see Use in Specific Populations (8.5)]. In a dedicated phase I pharmacokinetics study, following multiple 80 mg doses of ULORIC in healthy patients with mild (Clcr 50 to 80 mL/min), moderate (Clcr 30 to 49 mL/min) or severe renal impairment (Clcr 10 to 29 mL/min), the Cmax of febuxostat did not change relative to patients with normal renal function (Clcr greater than 80 mL/min). AUC and half-life of febuxostat increased in patients with renal impairment in comparison to patients with normal renal function, but values were similar among three renal impairment groups. Mean febuxostat AUC values were up to 1.8 times higher in patients with renal impairment compared to those with normal renal function. Mean Cmax and AUC values for three active metabolites increased up to two and four-fold, respectively. However, the percent decrease in serum uric acid concentration for patients with renal impairment was comparable to those with normal renal function (58% in normal renal function group and 55% in the severe renal function group). Following multiple 80 mg doses of ULORIC in patients with mild (Child-Pugh Class A) or moderate (Child-Pugh Class B) hepatic impairment, an average of 20% to 30% increase was observed for both Cmax and AUC24 (total and unbound) in hepatic impairment groups compared to patients with normal hepatic function. In addition, the percent decrease in serum uric acid concentration was comparable between different hepatic groups (62% in healthy group, 49% in mild hepatic impairment group, and 48% in moderate hepatic impairment group). No dose adjustment is necessary in patients with mild or moderate hepatic impairment. No studies have been conducted in patients with severe hepatic impairment (Child-Pugh Class C); caution should be exercised in those patients [see Use in Specific Populations (8.7)]. Drug interaction studies of ULORIC with other drugs that are metabolized by XO (e.g., mercaptopurine and azathioprine) have not been conducted. Inhibition of XO by ULORIC may cause increased plasma concentrations of these drugs leading to toxicity. ULORIC is contraindicated in patients being treated with azathioprine or mercaptopurine [see Contraindications (4) and Drug Interactions (7)]. Two year carcinogenicity studies were conducted in F344 rats and B6C3F1 mice. Increased transitional cell papilloma and carcinoma of the urinary bladder was observed at 24 mg/kg (25 times the MRHD on an AUC basis and 18.75 mg/kg (12.5 times the MRHD on an AUC basis) in male rats and female mice, respectively. The urinary bladder neoplasms were secondary to calculus formation in the kidney and urinary bladder. A 12 month toxicity study in beagle dogs showed deposition of xanthine crystals and calculi in kidneys at 15 mg/kg (approximately 4 times the MRHD on an AUC basis). A similar effect of calculus formation was noted in rats in a six month study due to deposition of xanthine crystals at 48 mg/kg (approximately 31 and 40 times the MRHD on an AUC basis in males and females respectively). A serum uric acid level of less than 6 mg/dL is the goal of antihyperuricemic therapy and has been established as appropriate for the treatment of gout. Study 1 (ClinicalTrials.gov identifier NCT00430248) randomized patients to: ULORIC 40 mg daily, ULORIC 80 mg daily, or allopurinol (300 mg daily for patients with estimated creatinine clearance (Clcr) ≥60 mL/min or 200 mg daily for patients with estimated Clcr ≥30 mL/min and ≤59 mL/min). The duration of Study 1 was six months. Study 2 (ClinicalTrials.gov identifier NCT00174915) randomized patients to: placebo, ULORIC 80 mg daily, ULORIC 120 mg daily, ULORIC 240 mg daily or allopurinol (300 mg daily for patients with a baseline serum creatinine ≤1.5 mg/dL or 100 mg daily for patients with a baseline serum creatinine greater than 1.5 mg/dL and ≤2 mg/dL). The duration of Study 2 was six months. Study 3 (ClinicalTrials.gov identifier NCT00102440), a one year study, randomized patients to: ULORIC 80 mg daily, ULORIC 120 mg daily, or allopurinol 300 mg daily. Patients who completed Study 2 and Study 3 were eligible to enroll in a Phase 3 long-term extension study in which patients received treatment with ULORIC for over three years. Randomization was balanced between treatment groups, except in Study 2 in which twice as many patients were randomized to each of the active treatment groups compared to placebo. Study 1 evaluated efficacy in patients with mild to moderate renal impairment (i.e., baseline estimated Clcr less than 90 mL/min). The results in this subgroup of patients are shown in Table 4. Allopurinol patients (n=145) with estimated Cl cr ≥30 mL/min and Cl cr ≤59 mL/min were dosed at 200 mg daily. A randomized, double-blind, allopurinol-controlled CV outcomes study (CARES) was conducted to evaluate the CV risk of ULORIC. The study compared the risk of MACE between patients treated with ULORIC (N=3098) and allopurinol-treated patients (N=3092). The primary endpoint was the time to first occurrence of a MACE defined as the composite of CV death, nonfatal MI, nonfatal stroke, or unstable angina with urgent coronary revascularization. The study was designed to exclude a prespecified risk margin of 1.3 for the hazard ratio of MACE. An independent committee conducted a blinded evaluation of serious CV adverse events according to predefined criteria (adjudication) for determination of MACE. The study was event driven and patients were followed until a sufficient number of primary outcome events accrued. The median on-study follow-up time was 2.6 years. Patients randomized to ULORIC initially received 40 mg once daily which was increased to 80 mg once daily, if their sUA was ≥6mg/dL at Week 2. For patients randomized to allopurinol, those who had normal renal function or mild renal impairment (estimated creatinine clearance (eClcr) ≥60 to ˂90 mL/minute) initially received 300 mg once daily with 100 mg/day dose increments monthly until either sUA ˂6mg/dL or an allopurinol dosage of 600 mg once daily was achieved; those who had moderate renal impairment (eClcr ≥30 to ˂60 mL/minute) initially received 200 mg once daily with 100 mg/day dose increments monthly until either a sUA ˂6 mg/dL or an allopurinol dosage of 400 mg once daily was achieved. The mean age of the population was 65 years (range: 44 to 93 years). Most patients were male (84%) and Caucasian (69%). Patients had a diagnosis of gout for approximately 12 years, a mean baseline sUA of 8.7 mg/dL, and 90% had experienced at least one gout flare in the past year. CV history included MI (39%), hospitalization for unstable angina (28%), cardiac revascularization (37%), and stroke (14%). The most prevalent comorbid conditions were hypertension (92%), hyperlipidemia (87%), diabetes mellitus (55%), diabetes mellitus with micro- or macrovascular disease (39%), and renal impairment [92% with an eClcr 30 to 89 mL/minute]. The use of CV disease medication was balanced across treatment groups. Baseline CV disease medications included: ACE inhibitors or ARBs (70%), lipid modifying agents (74%), aspirin (62%), beta-blockers (59%), calcium channel blockers (26%), and nonaspirin antiplatelet medications (31%). Table 5 shows the study results for the primary MACE composite endpoint and its individual components. For the composite primary endpoint, the ULORIC group was non-inferior compared with the allopurinol group. The rates of nonfatal MI, stroke, and unstable angina with urgent coronary revascularization were similar. There was a higher rate of CV deaths in patients treated with ULORIC (134 CV deaths; 1.5 per 100 PY) than in allopurinol-treated patients (100 CV deaths; 1.1 per 100 PY). Sudden cardiac death was the most common cause of adjudicated CV deaths in the ULORIC group (83 of 3,098; 2.7%) as compared to the allopurinol group (56 of 3,092; 1.8%). The biological plausibility of CV death associated with ULORIC is unclear. All-cause mortality was higher in the ULORIC group (243 deaths [7.8%]; 2.6 per 100 PY) than the allopurinol group (199 deaths [6.4%]; 2.2 per 100 PY) [Hazard Ratio: 1.22, 95% CI: 1.01, 1.47], due to a higher rate of CV deaths. Inform patients that gout patients with established CV disease treated with ULORIC had a higher rate of CV death compared to those treated with allopurinol in a CV outcomes study. Inform all patients of the higher rate of CV death with ULORIC compared to allopurinol. Instruct all patients (those with and without CV disease) to be alert for the development of signs and symptoms of CV events [see Warnings and Precautions (5.1)]. Inform patients that after initiation of ULORIC there was an increased frequency of gout flares. Instruct patients that it is recommended to initiate and continue gout prophylaxis therapy for six months while taking ULORIC [see Warnings and Precautions (5.2)]. Inform patients that hepatic effects have occurred in patients treated with ULORIC and instruct them to inform their healthcare provider if they experience liver injury symptoms [see Warnings and Precautions (5.3)]. Inform patients that serious skin and hypersensitivity reactions have occurred in patients treated with ULORIC. Instruct patients to discontinue ULORIC if they develop symptoms of these reactions [see Warnings and Precautions (5.4)]. Read the Medication Guide that comes with ULORIC before you start taking it and each time you get a refill. There may be new information. The Medication Guide does not take the place of talking with your doctor about your medical condition or your treatment. What is the most important information that I should know about ULORIC? ULORIC is a prescription medicine called a xanthine oxidase (XO) inhibitor used to lower blood uric acid levels in adult patients with gout when allopurinol has not worked well enough or when allopurinol is not right for you. ULORIC is not for use in people who do not have symptoms of high blood uric acid levels. It is not known if ULORIC is safe and effective in children. What should I tell my doctor before taking ULORIC? have taken allopurinol and what happened to you while you were taking it. have a history of heart disease or stroke. are pregnant or plan to become pregnant. It is not known if ULORIC will harm your unborn baby. Talk with your doctor if you are pregnant or plan to become pregnant. are breastfeeding or plan to breastfeed. It is not known if ULORIC passes into your breast milk. You and your doctor should decide if you should take ULORIC while breastfeeding. Tell your doctor about all the medicines you take, including prescription and over-the-counter medicines, vitamins, and herbal supplements. ULORIC may affect the way other medicines work, and other medicines may affect how ULORIC works. Take ULORIC exactly as your doctor tells you to take it. Your gout may get worse (flare) when you start taking ULORIC. Do not stop taking ULORIC because you have a flare. Your doctor may do certain tests while you take ULORIC. Heart problems. See "What is the most important information I should know about ULORIC?". These are not all of the possible side effects of ULORIC. Store ULORIC at room temperature. Medicines are sometimes prescribed for purposes other than those listed in a Medication Guide. Do not use ULORIC for a condition for which it was not prescribed. Do not give ULORIC to other people, even if they have the same symptoms that you have. It may harm them. You can ask your doctor or pharmacist for information about ULORIC that is written for health professionals. ULORIC is a registered trademark of Teijin Limited registered in the U.S. Patent and Trademark Office and used under license by Takeda Pharmaceuticals America, Inc.
©2009-2019 Takeda Pharmaceuticals America, Inc.
For more information, go to www.ULORIC.com or call 1-877-TAKEDA (1-877-825-3327).